Santosh is presently working as Program Associate in LEAD Deshpande Foundation, and has two years of work experience in the Development sector. 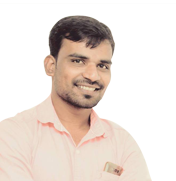 Prior to this, he worked as communication trainer and placement coordinator in Deshpande Educational Trust, Hubballi. He has trained more than 800 Graduate students and placed more than 100 students in banking and MNC, Santosh joined as a student to the LEAD program and took more than 50 social and Educational Initiatives, Due to his dedication and commitment, he was promoted as Master Leader. For the project, life skills to the orphan kids and Involving in Identifying the school dropout students and connecting them to schools has received Best Leader Award. He received Lead Ambassador Award for mentoring more than 100 students during his period of Internship. He has also volunteered in various activities such as Google Ink talks, and National Service Scheme (NSS). Santosh is more passionate towards writing. He is habitual writer he has written more than 50 articles for many renowned Kannada newspapers and other online platforms.